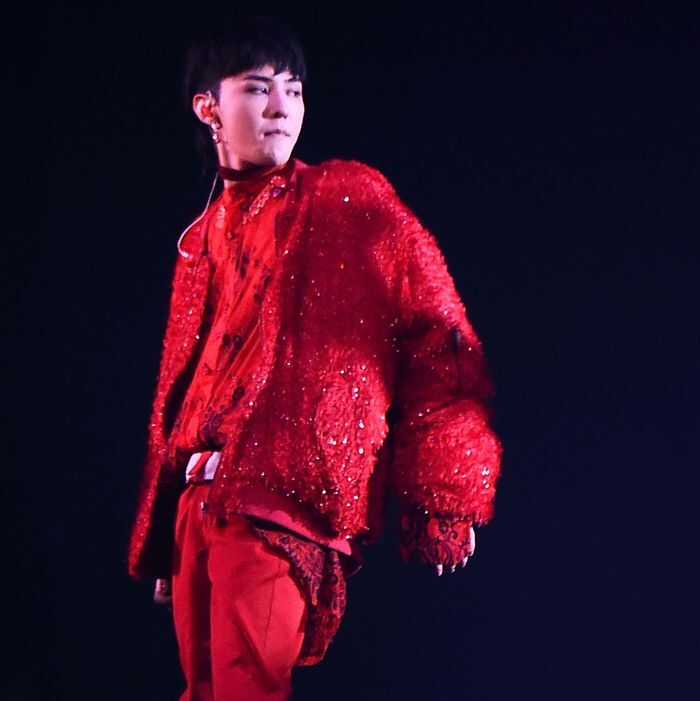 G-Dragon serving a monochromatic red look at the Barclays Center in Brooklyn. By all accounts, G-Dragon’s performance last Thursday at the Barclays Center was his last one in New York for a while. Once his world tour, Act III: M.O.T.T.E. (which sounds like the Korean word for womb and is also an acronym for Moment of Truth the End), finishes in the fall he’s due for Korean boy-band heaven, a.k.a. mandatory military service, a roughly two-year requirement that not even millions of screaming fans can get you out of. The two-year conscription has effectively killed many music careers (RIP Rain), because the Korean music machine crunches onward without you, and there’s always someone younger, shinier, and better coordinated waiting in the wings. So for almost two hours, G-Dragon rapped, caterwauled, and crooned his way through his past three solo albums, including his latest, Kwon Ji Yong — his given name — to give his New York audience a farewell. It was both an opportunity to say good-bye and a chance to stake out his legacy beyond the one that made him famous: his debut with the boy band Big Bang back in 2006. Pop music crystallizes time and place, so when I think about G-Dragon, I remember the first time I moved to Seoul in the summer of 2008. Big Bang had just released “Haru Haru” (“Day by Day”), the undisputed song of summer — and as I can now attest, decade. The song was everywhere, from speakers outside of beauty shops on the street to variety shows on TV, to late-night karaoke sessions where it was a requirement that I, at the very least, sing the chorus. I was new, but I was no fool. The lyrics, written by G-Dragon, about the pain of letting someone you love go aren’t exactly groundbreaking stuff, it was more the sound — a mix of dance and rap and ballad that leveraged the strengths of all five members and became one of their signatures. What was once innovative has since been copied and standardized to the point where almost every boy band now has a charismatic rapper with a booming voice. The music video had a plot fit for Korean dramatic sensibilities: The protagonist (played by G-Dragon) believes his girlfriend is cheating on him with his friend (played by fellow rapper T.O.P.). Of course, the twist is that they were only pretending to cheat because she was dying and wanted to spare her love the pain of watching her die. (Just go with it.) G-Dragon learns of this too late and arrives at the hospital to an already-gone girl. It was stupid and dramatic and I loved it. More importantly, “Haru Haru” launched Big Bang into the canon of Korean pop music and proved that they were more than one-hit wonders. When they debuted in 2006, Big Bang struggled to find their groove, coming up with a No. 1 hit a whole year later — eons in K-pop time — with the song “Lies.” (This also has a dramatic — and arguably superior — music video). But “Haru Haru” tapped into the Zeitgeist, blending a deep affinity for torch songs with the swagger of hip-hop, and set a wildfire to the K-pop fandom. The song is now regarded as one of the most influential to come out of Korean pop music, but maybe more saliently, it gave Big Bang — and its ringleader G-Dragon — a wider berth to become stranger, more exploratory, and idiosyncratic. By the time GD&TOP, a collaboration between G-Dragon and T.O.P., came out on Christmas Eve of 2010, G-Dragon had fully come into his own. The album skips around genres effortlessly: Synth club bangers like “High High” and “Oh Yeah” sit next to an effortlessly cool, Diplo-produced track called “Knockout,” and a bright and cheeky pop song “Don’t Go Home” — the latter two were censored by Korean broadcasters for lewd content. More and more, G-Dragon was embracing the aesthetic mélange that’s inherent to K-pop’s DNA. Rather than get buffeted by South Korea’s rapidly shifting fashion winds, he was a master and commander who existed in a near future where every color was psychedelic and gender didn’t matter. Trends? G-Dragon blended them up and ate them for breakfast. His hair has been every shade of highlighter, he was into giant fur aviator hats for a while, and in an especially iconic moment, he appeared on the cover of Vogue Korea with long blond hair, looking like an androgynous model. The best example of his chameleonic power is “Crayon,” from his 2012 album, One of a Kind. It demonstrated his ability to metabolize pop culture and fashion on a global scale and reform it into his own aesthetic. The single and the accompanying music video are full of jokes, from the “Giyongchy” beanie as a nod to Korea’s burgeoning fast-fashion industry, to the Joker in The Dark Knight, to the song title itself, where he asks you to “get your cray on.” He uses the full palette of the rainbow, too, opening with a popping pink Wonder Woman robe before moving to jackets in holographic gold and Thom Browne’s 2012 fall collection with its fun-house proportions. He also appears in drag, because why are we taking any of this so seriously? I loved how weird G-Dragon was. I liked that he didn’t feel that he had to bend to popular pressure to get swole the way other boy bands — like 2PM, 2AM, and DBSK (Dong Bang Shin Ki) — did. Even now, he’s as skinny as ever, and despite his relative size, his aesthetics are defined by excess. He is too much, all the time. There are too many references and ideas, colors and shapes — yet on him, they feel just right. Where there’s a constricted idea of masculinity in society, G-Dragon exploded the paradigm for how a man could be. He was like Prince, only less interested in making his body a sexual object. In G-Dragon’s world, fashion could be fun, playful, and joyful, rather than exacting and serious. Clothes could be an expression of your core identity, or they could just be something you’re trying out — a mood, a whim, or an idea. He was postmodern in the best sense of the word. He proved that you could, in some way, be anything and everything, and for someone coming to Korea from America by way of Florida, this was an absolutely breathtaking way to exist. This, too, was a performance. But there was something touching about the artifice, the self-constructed gestures and affected American accent that made it feel like something true — an attempt to remind people that G-Dragon was more than the sum of the past decade. What he was saying was that he wants to avoid the fate of other former boy-band idols whose careers faded away after their two-year military hiatus, and establish himself as an artist for a lifetime. At the end of his 22-song set list, he sang “Untitled, 2014” — a simple, pared-down track about wanting to get someone back because a love like that just doesn’t come around twice. A red baseball cap shaded his eyes when he told the audience, in English, “You guys really get me.” I really felt like I did.